Book Type: B&W 6.0 x 9.0 x 1.2 in. The first edition of Think Success was published in 2010. This new edition was published nearly after four years in 2014, with many additions, deletions, and improvements. The essays were revised and updated, based upon the inputs received from readers and critics, and to reflect the recent developments in related fields. In the first edition, the information was arranged in two sections. The distinction is now removed. All the articles that were published in the first edition are retained. 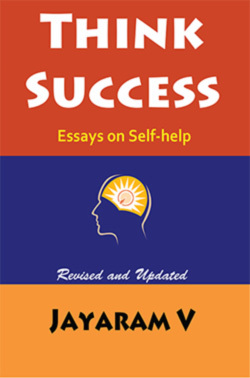 The book contains 44 well researched articles on self-help, skill-development, attitude correction, behavioral problems, personality development, success, goals, happiness, peace, prosperity, emotional wellbeing, etc. They deal with various aspects of self-growth and improvement. You can use them for reference, inspiration, guidance, self-motivation, or to improve specific skills. They You will find in them helpful and inspirational information, besides solutions to many common problems people face in their daily lives. You can use them to reinforce your thoughts or find new possibilities and opportunities in problem solving and decision making. Each essay is independent in itself and has no correlation with others. Hence, you can read the book at your convenience, and use it as a reference. Preface - Introduction - Why Self-Development? - Effective Listening Skills - Critical &amp; Analytical Reading - Develop Your Negotiation Skills - Accept Full Responsibility for Your Life - Coping With Fears - What You Can Learn From Successful People - How to Improve your Memory - Dealing with adversity - Success Principles Worth Following - A Lesson in the Art of Appreciation - The Art and Science of Relaxation - Becoming Aware of Yourself - The Building Blocks of Your Life - Career Development - Witnessing Your Own Fears - Coping With Failure - Planning Your Day - Dealing with emotions - Dealing with the Problem of Loneliness - Health and Fitness - The Power of&nbsp;Your Thoughts - The Power of Attraction - The Power of Determination - The Power of Positive Affirmations - Positive Thinking in Daily Life - Priority Areas of Life - Simple Relaxation Techniques For Your Eyes - 15 Effective Ways to Deal with Adversity - How to Manage Your Self-talk - Mental Maturity and Adult Behavior - How to Cultivate Mental Peace - Morals from Aesop's Fables - Problems and Problem Solving - The Pillars of Prosperity - Planning Your Vacation - Positive Mental Attitude - - Protecting Your Health - Simple Pleasures of Life - Stop Blaming Others - - Qualities of Successful People - Working with Long Term Goals - Overcoming the Monotony of Life - The Power of Positive Affirmations - How to Improve Your Self-Esteem - Recommended Reading.